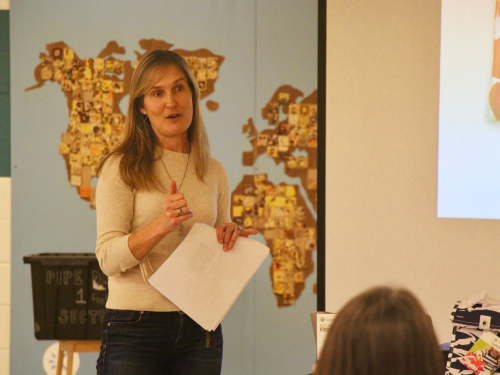 KID Museum recently hosted its first ever Innovation Exchange for area middle schoolers, featuring special guest speaker Kirsten Quigley, Founder and CEO of Lunchskins. Students received inspiration from Quigley, and mentorship from local professionals, all in support of their Invent the Future Challenge work. To kick off the Exchange, Kirsten presented the story behind her innovative reusable fabric and biodegradable bags, which help prevent plastic bags from winding up in landfills and oceans around the globe. The Invent the Future Challenge aims to inspire all middle schoolers to identify problems big or small, and develop a solution just like Kirsten did. One Invent the Future team works with a mentor to further improve on their ideas. 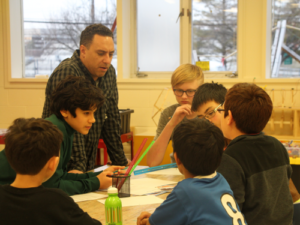 With questions ranging from cost of production to prototyping, students were highly engaged and interested in how they too can turn an environmental problem into a successful business—while also making a positive impact on the environment. After Kirsten’s presentation, students were able to further develop their Challenge ideas with mentors. Scott Tjaden of Pepco’s Watershed Sustainability Center, and other professionals were on hand to guide teams through the brainstorming process. This was the first in a series of Innovation Exchanges scheduled monthly. Exchanges are free but space is limited, so save your team’s spot by registering early.